One of the most frightening type of collisions a person may be involved is a head-on accident. This type of car accident occurs when the front-end of two vehicles collide, often on a road where no median is present. In Illinois there were an estimated 281,788 car accidents reported in 2011 and less than 1 percent were head-on collisions. However, there were more than 2,100 head-on accidents that same year and 3.8 percent were fatal accidents. 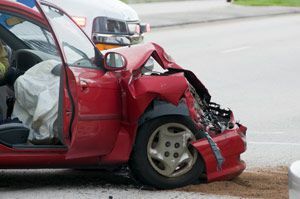 Commonly these types of accidents involve two-vehicles however, in some cases it involves a vehicle colliding with a fixed-object such as a light pole, fence, or tree. These types of accidents can be very serious and result in many different types of injuries. If such a crash involves speeding the consequences may be deadly. Have You or a Loved One Been Seriously Injured in a Head-On Crash by a Careless Driver? Did you know that the victim may be entitled to compensation for property damage, medical expenses, pain and suffering, and more? At The Tapella & Eberspacher Law Firm, we have DETAILED knowledge of the traffic laws in our state and will fight for your MAXIMUM compensation amount. Rural roads are a frequent location of head-on crashes, however, neighborhood roads and most others where a median does not prevent two vehicles from colliding can also lead to such a crash. According to an analysis of the Fatal Analysis Reporting System, in 1999, 75 percent of head-on wrecks occurred on un-divided two-lane roads. Furthermore, poor construction-zone redirecting and not knowing the area too well can lead to a driver turning down a one-way road and colliding with another vehicle. According to the same analysis of the Fatal Analysis Reporting System, 4.2 percent of the accidents surveyed were caused by failing to pass or overtake another vehicle. In Illinois, there were more than 2,000 persons injured in head-on collisions, overall these types of crashes were the cause of 2 percent of all accident injuries in the state. The type of injuries a person suffers can also depend on what types of safety devices were in-use. A driver or passenger who was not wearing a seatbelt may suffer from more serious injuries particularly if they are ejected from the vehicle at the time of impact. Head-on collisions are one of the most deadly types of accidents that could happen as all those situated in the front part of any vehicle will likely be injured. At The Tapella & Eberspacher Law Firm, we understand how frightening a head-on crash can be, particularly if it was due to no-fault of your own. We are dedicated to helping victims or negligent accidents fight for their right to fair and just compensation. Our attorneys will work hard to top experts in such areas as accident reconstruction, civil engineering, product design, and toxicology to make a powerful case. …and many more local areas. We are also pleased to serve those who have been carelessly injured. To learn more about your legal rights, contact us at 1-855-522-5291. One of our intake staff members will connect you with one of our lawyers best suited in handling your claim after a few initial questions about your case. You can also contact us online. Simply fill out the ‘Get Help Now’ form on this page and your information will be reviewed right away.